A few weeks ago I had the opportunity to go to an exclusive sneak peek of the AIBA dinner menu. The PR company who invited me to that sneak peek have now sent me a bottle of the limited edition beer to go with that meal. This is that beer! 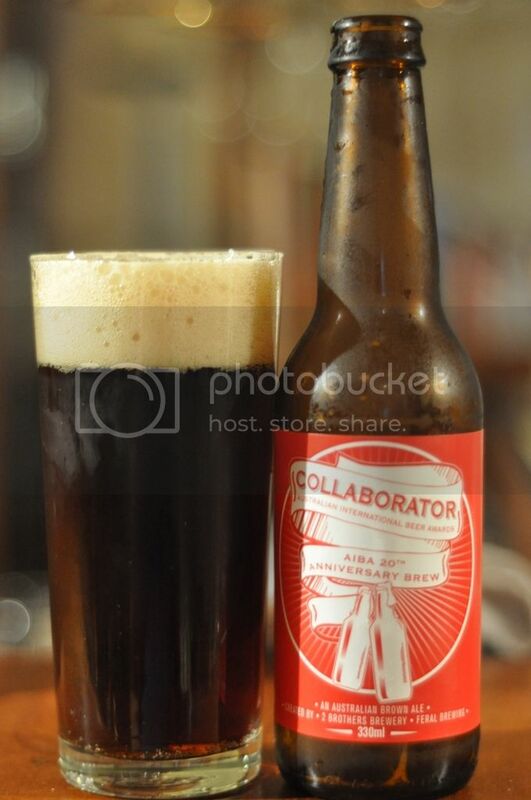 The Collaborator is the work of 2 Brothers brewery and Feral brewery, I'm a big fan of both so this is pretty exciting! The idea behind this beer was to incorporate as much as possible from the Australian brewing industry including using 100% Australian ingredients. Only 20 cases of this beer have been produced and almost all are going to be drunk on the night so to get one is a pretty incredible opportunity. From the pour this looks like a pretty standard looking brown ale. The beer is a dark brown colour (obviously!) with a reddish tinge. Actually as you hold it up to the light it looks quite red, almost a mahogany colour. The head is a cream colour with some nice small air bubbles in it, there is exxcellent retention and it even provides some lacing. It's an impressive looking beer, good start! My first impressions of the nose on the Collaborator is that it has an unusual ammount of hops for an American Brown Ale. There are some nice caramel malts as to be expected and also some nutty aroma, which I can't quite place. The hop aroma is fantastic and reminds me of a mildly bitter IPA, which would be fine if this was an IPA... It's a brown ale and the nose and colour seem to be contradictory. In saying that I really like the aroma and if you close your eyes it's lovely! 2 Brothers and Feral have done a lovely job with this beer. This beer will have something for non-beer drinkers and connoiseurs alike, it's simple yet complex at the same time. Collaborator manages to balance a caramel malt body and a strong hop flavour without either ever dominating the palate. I don't really know what to say, the flavours are awesome as is the drinkability. In my mind it's a mix of the 2 Brothers Growler and Feral's Hop Hog, which have somehow been interwoven to make a delicious beer! This is a real piece of brewing artistry! The people present on Thursday night at the Awards Presentation Dinner will get to sample a pretty incredible beer. It's quite different to any other Australian beer that I've come across but has elements of both breweries styles that are quite clear to see. It's a very distinctive beer, which is going to go fantastically with food! I'm a huge fan of this beer, such a shame it's not getting a public release as it would sell really well! If you want something similar I would suggest the Mornington Brown Ale, a slightly less complex beer but equally drinkable.